Modeled on the Venetian palazzos of Venice, Italy, the magnificent Ca' d’Zan was John Ringling’s love letter to his beloved wife Mable. Today’s special events bring back the faint echoes of music and laughter and love that lived here once and live here yet again. Take a few moments to rest, relax and contemplate the beauty that surrounds you in Sarasota’s most splendidly scenic spot. From the mixing of the terra cotta to the glazing of the tiles, there is no detail that doesn’t bear Mable’s imprint and reflect her sense of design. It’s only fitting that the Circus King’s castle should be filled with majestic furnishings, paintings and objects d’art. So it is at the Ca' d’Zan. Tour upstairs and downstairs. Catch a glimpse of how one of America’s richest couples and the people that served them lived. The home of the circus king and his wife, a couple from humble mid-western origins, Ca’ d’Zan stands as a testament to the American Dream of the Roaring Twenties. Inspired by and designed in the Venetian Gothic style of the palazzos that ring the Venice canals, this dazzling palatial mansion perfectly captures the splendor and romance of the Italy the Ringlings so loved. To honor its owner, they named it Ca’ d’Zan, “House of John”, in the dialect of their beloved Venice. Friends of the Library are invited to meet with experienced Librarians leading behind-the-scenes tours, lectures, and receptions showcasing the Library’s unique collections. Friends of the Ringling Legacy celebrate the history of John and Mable Ringling and their vision for their home, art museum, and the circus that made it all possible. 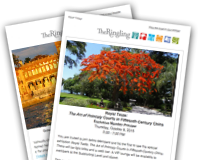 Friends of the Ringling Legacy will have unique opportunities to explore Ca' d'Zan, the Museum of Art, the Circus Museum and the Bayfront Gardens. We are happy to announce a special offer this summer just for homeschoolers! We invite your family join us at The Ringling to explore the first floor of the Ca d’Zan. There will be docents stationed around the mansion to answer your questions, and a student guide to help your children learn more about Ca' d'Zan.